DroneMobile Support for Google Home/Assistant! 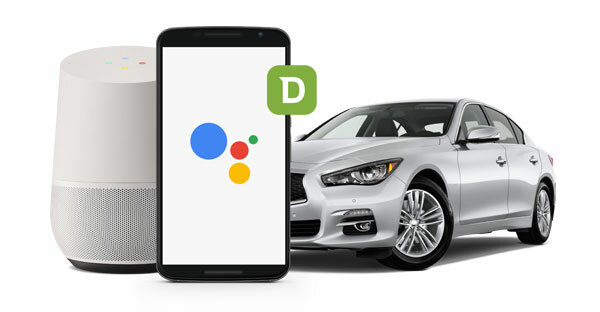 Firstech is excited to make DroneMobile the first aftermarket connected car solution that integrates with Google Assistant-powered products, such as the Google Home. 1. Download the Google Home AND the Google Assistant App. 2. Login to your Google account on the Google Assistant App. 3. Tap on “Explore” at the top of the page. 4. Scroll down to “Travel and Transportation” section, tap “More”. 5. Locate and tap on the DroneMobile option. 7. Enter your login credentials, and create a 4-5 digit pin for unlocking your vehicle using your Google Home device. Your Google Home device/app will utilize the preferences and settings you set up in the Google Assistant application. Due to safety concerns, this first version of the DroneMobile-Google Assistant application does NOT include remote start features. Our team will be working hard over the summer to analyze user behavior to understand how to safely implement remote start features into voice command applications. Trunk Release • "Ok Google, tell DroneMobile to open the trunk on (Vehicle Name)"
Vehicle Status • "Ok Google, ask DroneMobile to check status of (Vehicle Name)." GPS Car Finder • "Ok Google, ask DroneMobile where (Vehicle Name) is." • "Ok Google, tell DroneMobile to find (Vehicle Name)." Help • "Ok Google, ask DroneMobile for help." Note: you can also say "Ok Google, talk to DroneMobile." Then, when you follow up with another command, you can simply say "Lock (Vehicle Name)."